The crew slowly left over the past couple of days back to Toronto. I feel like my trip has now officially started, considering that I’m now solo. Admission to the observatory, including the planetarium, is free. Yesterday we spent the day checking out a few sites in the city, including Griffith Park and its observatory. We drove up to the Trail Cafe, where we parked the car. Hiking up to the observatory took about 25 minutes and was totally worth it. Take the time to stop half way up and look behind you to see great views of Los Angeles and Santa Monica. The Observatory was built in the early thirties in order to make astronomy more accessible to the common folk. 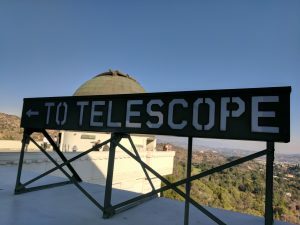 Previously, all observatories were inaccessible because they were located high atop mountains, which only dedicated astronomers would take the time to go visit. The Griffith observatory was used during the second World War to teach pilots celestial navigation. Later, during the 60s, it was used to teach the Apollo astronauts the same thing. 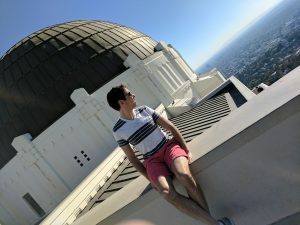 Being Los Angeles, even this place of science has paid homage to the world of film by recognizing the movie “Rebel Without a Cause” for its accurate portrayal of the observatory in the film. Don’t forget to checkout the bust of James Dean in the north-west portion of the grounds. After filling up on scenic views and science, we decided to head down to Melrose to checkout some of the eclectic stores and tattoo shops. Personally, I was a little underwhelmed with the Melrose strip. It had a similar feel to Queen West in Toronto, but just wasn’t able to pull it off. Having lunch at Ta-eem grill was the highlight of the afternoon. This place is hands down the best Shawarma in the city. After having a nap back at the AirBnB the four of us decided to head up to one of LA’s infamous comedy clubs. 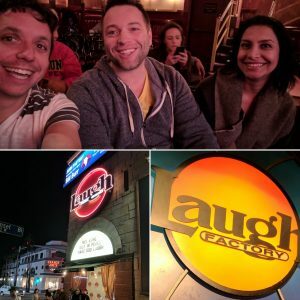 We decided on the Laugh Factory in West Hollywood. This was the same location where Michael Richards (of Kramer fame) had his meltdown. $20 and a two drink minimum bought us 2 hours of laughs. It was way better than I expected and the comics (with the exception of the last one) kept our bellies hurting all night with laughter. 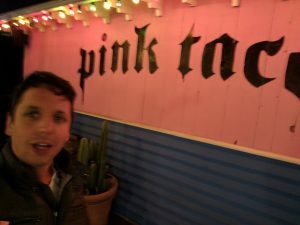 Tipsy and hungry, we stumbled to the Pink Taco, just down the street. Taco Tuesday didn’t disappoint with $3 tacos. The next day, after the rest of the crew left, I headed into Downtown LA to enjoy some amazing German food at Wurstküche. Their beer selection is great. I had two pints, a Kölch and a Schneider-Wiesse. 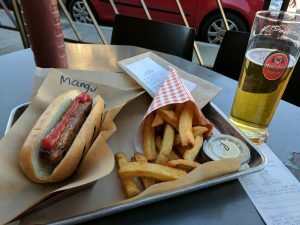 The mango jalapeño sausage was decent, I should have known to stick to traditional german sausages. Getting around town is super cheap with Uber Pool. It only cost me $3.89 to go about 9km. Back home, in Toronto, this would have cost me closer to $13.00. Taking Uber Pool also gives me an opportunity to meet super interesting people. Just today, I was riding with Nicol. She want’s to be a fashion forecaster. Yup! That’s right. A full time job exists for people who can predict the next trends in fashion. Armed with cheap Ubering and a $50 off for my next 10 Lyft rides… seeing America by ride sharing companies is totally doable. Tomorrow I’m off to the largest state in the USA: Texas. Keeping an open mind, and I’m looking forward to checking out Houston and Austin.